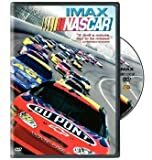 This exciting documentary showcases the world of NASCAR racing, the number one spectator sport in America. IMAX's 3D cameras are mounted on the outside of the cars and put you right into the action. You'll speed down the racetrack at 200 mph, visit the pit and learn what it takes to be a top racer. There are plenty of interviews with top racers and behind the scenes footage that both racing enthusiasts and new fans will enjoy.